Fight. Dream. Hope. Love. Universal has revealed this new poster for Tom Hooper's Les Misérables, the "musical phenomenon" turned into an amazing-looking movie. While the cast features incredible names like Hugh Jackman as Valjean, Anne Hathaway as Fantine, Helena Bonham Carter, Russell Crowe, Sacha Baron Cohen, Eddie Redmayne and Amanda Seyfried, this shows none of them. It's a nod to the original Broadway poster, featuring only the young Cosette with her beautiful eyes. Here it's the same but "live-action". The actress seen is Isabelle Allen as the young Cosette, portrayed older by Seyfried. It's still a stunning image! 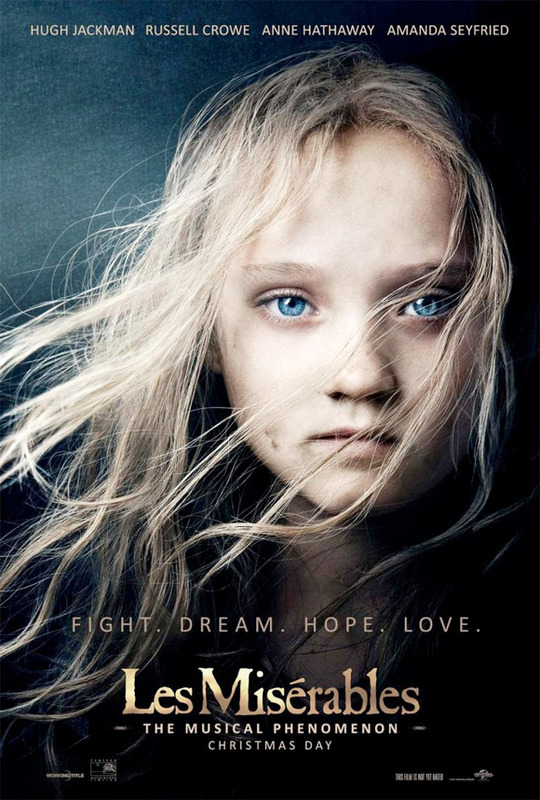 Here's the new Les Mis poster, found via ComingSoon. I like it - but where are the color streaks in her hair? If you haven't seen it yet, watch the amazing extended first look at Les Mis showing the "live singing" on set. Hate to be That Annoying Nitpicker, but: "Hugh Jackman as Javier" Hugh Jackman plays Valjean. Crowe plays Javert. :] I love this poster. Great idea to go with the classic Cosette image brought to life! I guess the Brits get the last laugh, remaking a classic French tale. I know of thousands of British people that love this classic tale. Just because they do doesn't mean they are committing treason or any silly thing like that. Of course. I was just teasing. I'm having chills down my spine again just by looking at the poster. It's amazing and perfect for Christmas! Yup, the image was brought to life. Wait, doesn't she look like Dakota Fanning? Am I the only one who hates the new poster? Cosette should gaze past the viewer at something he can not see. That is her mystery; it's what makes her so haunting. Shifting the gaze lurches straight into the Uncanny Valley and makes Cosette not haunting but spooky. I keep expecting her head to start doing a 180 while the Voice of Zul issues forth from her mouth.